This series was started back in 2010 and is being brought back out for the 2012 fantasy season. 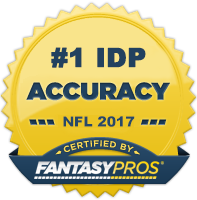 In the article, two IDPs with similar ADPs will be compared and judged on five different categories: Tackles, Big Plays, Opportunity, Health, and Safeness of the Pick. For simplicity's sake, when analyzing these players only projected 2012 production will be taken into account. In other words, only their redraft value is being judged. Tackles: Both of these players have 100+ solo tackle upside and will likely lead their respective team in total tackles. McCarthy ultimately comes out in top in this category, however. He registered 54 solo tackles and 14 assisted tackles in the 8 games he started last season. Over the course of an entire season, this translates into 108 solo tackles and 28 assists. Very impressive numbers for a rookie. Owners should only expect those numbers to rise now that he's had an entire year to familiarize himself with the system and to properly heal his shoulder. Washington was very solid in his own right with 94 solos and 11 assists and is a low-end LB1, but he just doesn't have the top 5 tackle potential that McCarthy possesses. Big Plays: Washington wins this category fairly easily. He's quickly become the centerpiece of Ray Horton's aggressive and physical 3-4 defensive scheme and is used often in a pass-rushing capacity. He had 4.5 sacks last season to go along with 2 INTs. Expect more of the same from him this season. Opportunity: The Titans have had an absurd amount of tackle opportunity over the last couple of seasons which has resulted in relatively large tackle numbers for players such as Stephen Tulloch, Jason McCourty, Michael Griffin, and Cortland Finnegan. The Titans offense is expected to be better this season which could mean a significant decrease in snaps for defensive players, but chances are still good that McCarthy will still see a higher number of overall snaps than Washington once the year is out. Health: Both players are in the beginning of their NFL careers and haven't sustained any serious injuries. McCarthy struggled with a shoulder problem early last season but showed that it wasn't really an issue. This one is a draw. Safeness: Washington is a better all-around NFL talent than McCarthy and was drafted with the expectation that he would be the team's next Karlos Dansby. Additionally, he's shown that he can produce top 10 numbers over the course of an entire 16 game season whereas McCarthy has only started 8 games in his short pro career. DWash is the safer, higher floor pick. WINNER: For all intents and purposes, this showdown is a tie. However, I give the edge to McCarthy in balanced and tackle-heavy leagues due to his extremely high tackle potential. Stephen Tulloch put up MONSTER numbers in this position in 2010 and McCarthy closely mirrored that production during the last 8 games of the 2011 season. He's got top 5 potential and is a dark horse candidate to lead the league in solo tackles. So who do you think wins this battle? Any suggestions for future battles? Send your comments/questions via email, Twitter, or the comments section below.